[prMac.com] Luxembourg City, Luxembourg - publicspace.net today is pleased to announce the release of A Better Finder Attributes 5.10. The new version now supports adjusting EXIF timestamps in Sony's ARF RAW image file format. 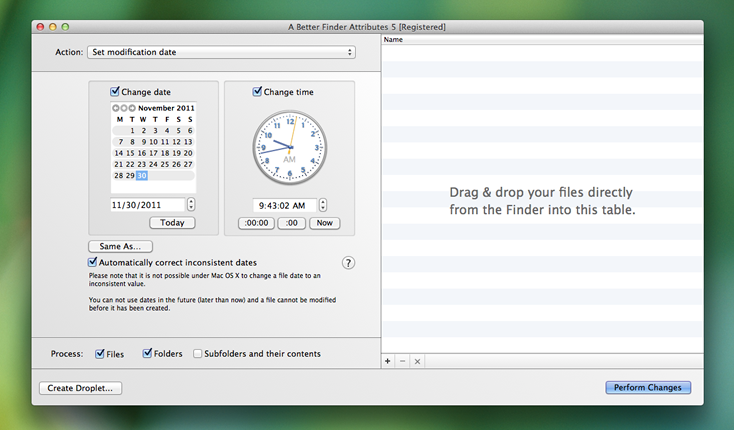 A Better Finder Attributes remains priced at $14.95 (USD). Family, Business and Enterprise Licensing is available. The product is also available from the Mac App Store under the name "File MultiTool 5". publicspace was founded by Frank Reiff in 1996 with the aim of producing affordable best-of-breed software for the Macintosh. In the past decade, our A Better Finder series of file utilities and our MacBreakZ personal ergonomic assistant have become familiar fixtures of the Macintosh community. publicspace is also produces "The Big Mean Folder Machine" and Vitamin-R. Copyright (C) 1996-2012 publicspace. All Rights Reserved. Apple, the Apple logo and Mac are registered trademarks of Apple Inc. in the U.S. and/or other countries.